It's hard to believe this car is 24 years old. It seems like it was only a few years ago that I saw one for the first time. 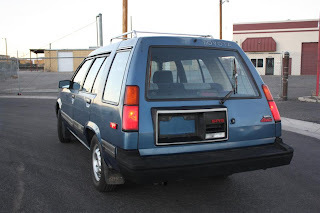 The concept of "not quite a station wagon / not quite an SUV" is pretty common now. Back in 1983, when this car was introduced, it was almost unheard of. The Tercel SR5 4WD is a true 4WD vehicle. 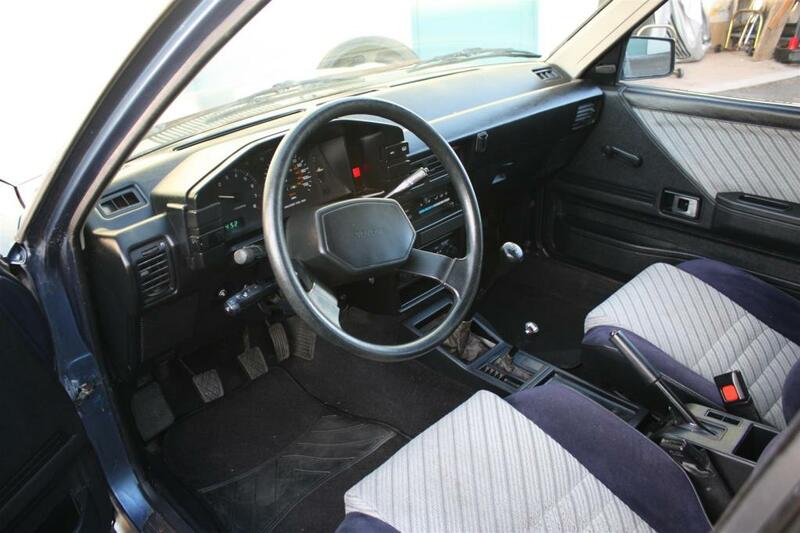 You shift it in and out of 4WD with a lever between the seats. It can only be used in 4WD on loose or slippery surfaces. In 2WD you had 5 forward gears. 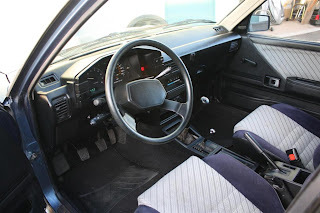 When 4WD was engaged you could use an extra gear (extra low) that effectively made the transmission a 6 speed. The biggest flaw in this vehicle is the engine. It's a 1.5 liter 4. It took over 18 seconds for this car to reach 60 MPH. 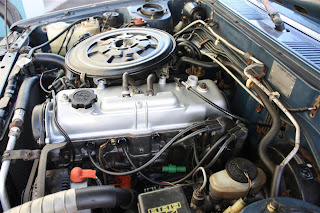 It's actually a good engine and was used in many other Toyota cars, but in the Tercel 4WD it was prone to overheating and head gasket failure. I suspect that had more to do with the owners revving the daylights out of the engine to get the car moving at a reasonable pace than any inherent flaw in the engine itself. The body had a different look to it than most anything else on the market. The bottom of the rear side windows didn't line up with the rest of the glass. The tailgate, with the offset license plate frame / handle, sort of reminds me of the doors on the first refrigerators with ice dispensers. While I've grown more accustomed to it over the years, I still don't know if I like the overall styling of this car. This car has had quite a bit of work done to it, including an engine rebuild. The body is in respectable condition for a 24 year old car. It wouldn't take much to make it perfect. Tonight, on a 20 minute drive from a friend's house, I encountered rain, sleet, freezing rain, snow and hail. (Gotta love New England!) While I wouldn't want to drive a Tercel 4WD every day, tonight, at least for those 20 minutes, I would have traded my BMW for this car in a heartbeat. 28 years after its introduction, this car is still unique. It would be a very cool winter beater. Located in Sparks, NV, click here to see the eBay listing. A big thanks to Jon for sending me the link to this car! Had the 2WD version of this for several years in early-mid 90's. Great station car and for running around town. Darn thing couldn't get out of its own way with an auto trans. But it was very simple, super reliable and had a high degree of utility - eg dump runs, hardware store etc. The rear storage area is rather roomy and very tall. I used to stand 2 garbage barrels upright in the back for runs to the dump! Now we have our SUV's and mini-vans ... blech! I test drove one of these a few years ago. I was looking for a cheap car to drive one-way to Alaska from the lower 48. I wouldn't say the engine was anemic, but the acceleration, on city streets, was definitely "relaxed". Nice find, love it!.....well apart from that damn auto box, getting on a highway would be a white knuckle experience. This one's a 5spd w/granny. My first car! I've owned probably 5 of these, some FWD, on auto 4WD. Great, fun little cars. They all rusted away before the engines quit, and they all used oil! $3500 seems a bit steep with all the dents and no real shots of the roof (which from the rear looks pretty sun-burned), though he lists lots of recent work done. Is 157K really "lower mileage"? I love the roof rack! 1987 was the final year for these. They were replaced by the Corolla 4wd (later All-Trac) wagons which sported live rear axles and a lock-able centre differential. I'm very familiar with both cars in cold/snowy climes and they performed with aplomb. 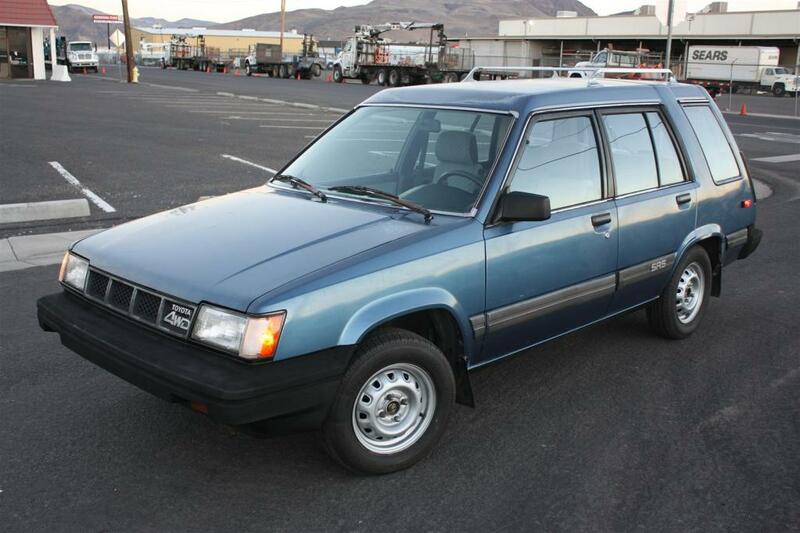 The Corolla was "upgraded" to a 1.6L but was just as rust-prone as the Tercel. I sent this link to JACG after spending nearly a hour watching Tercel owners torturing their vehicles on YouTube. Type in "Tercel 4WD" and see for yourselves. I notice this one doesn't have the optional dashboard-mounted two-axis inclinometer. Gotta have one of those to be a "real 4x4"! !